If you are looking for a kids’ book about bullying that provides a lot of information in an easy-to-digest format, I recommend The Skinny on Bullying. 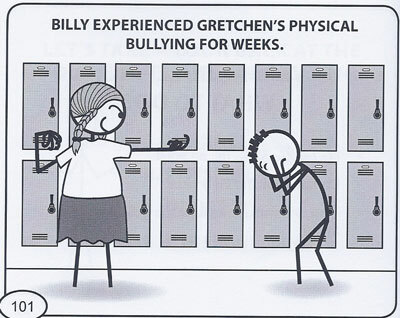 This 214-page book is subtitled The Legend of Gretchen and uses a comic book-style story to introduce key information about bullies and bullying, including the different forms of bullying, how to avoid being bullied (or being a bully), helping friends who are being bullied, avoiding cyberbullying and talking to an adult when you are being bullied. The Skinny on Bullying would be particularly helpful to the student entering middle school, although I would also recommend it for younger and older kids. After [the] introductory messages to those being bullied and to bullies, and an author’s note, the story begins. Presented in comic book form, the story centers on two popular fifth graders, friends Billy and Beth, who are getting ready to start middle school. They have to deal with the transition to a new school and to new people, some of whom are bullies. As the story continues, the author points out the four main types of bullying: physical, verbal, indirect and cyberbullying. He emphasizes what he calls The Golden Rule for dealing with bullies: “Talk to an adult.” Cassidy also stress the importance of standing up to bullies and helping other kids who are being bullied. Cassidy cleverly introduces the topic of how to avoid bullies by wrapping the subject around a lesson in Billy and Beth’s science class during which the teacher shows how kids can avoid bullies by “using the rules of the ocean.” This includes staying in groups like fish do, avoiding places bullies (big fish) like to congregate, and standing up for yourself like the puffer fish does when confronted by a predatory fish. I found the rest of the book, which centers on the legend of Gretchen, to be particularly enlightening because of what it reveals about bullying and bullies. Rumors are flying about a new student who is transferring to their school. According to the legend Billy and Beth hear (and share with others), Gretchen is a monster, “born with razor-like horns, fangs and claws,” and raised by wolves until she became so powerful the wolves sent her back home. When Gretchen enrolls in their school, she brings a flood of bullying with her in all its forms: verbal, physical, indirect (spreading nasty rumors) and cyberbullying, with nasty comments about Billy and Beth and others on her Facebook page. As the story unfolds, information about each type of bullying is provided, along with appropriate responses. There are also several pages of photos and comments from such celebrities as Taylor Swift and Taylor Lautner about being bullied as kids. In another section of the book, there is the inspiring story of swimmer Michael Phelps who was bullied as a kid but went on as a young adult to win 14 gold medals in the Olympics. When Billy and Beth finally talk to the principal about Gretchen, they are surprised to find out that they, too, have been guilty of bullying by telling everyone the legend of Gretchen when they knew it wasn’t true. With the help of the principal and a new understanding of what bullying is and why people bully, Gretchen, Billy and Beth all learn some good lessons about bullying and getting along with others. However, as the author points out, not all bullying problems end in friendship. Cassidy concludes with a further reminder to use the strategies outlined in the book to stop bullying. I recommend The Skinny on Bullying for middle grade readers (grades 4-8), particularly kids in, or starting, middle school, as well as adults. It can also be helpful for readers, including younger children who are being bullied (or are being bullies), and their parents to read and discuss the book together. « What Advice Would You Give a Child About Bullies?